March 15, 2016 (Tony Cartalucci - NEO) - US special interests have been pursuing a decades-long regional agenda in Southeast Asia in an attempt to create a united supranational front with which to confront Beijing. Exposed first in the "Pentagon Papers" in the 1970's, it was revealed that three fronts existed along which the US sought to "contain" China; the Japan-Korea front; the India-Pakistan front; and the Southeast Asia front. America's military occupation of Afghanistan, Japan, and South Korea, along with the South China Sea confrontation it is cultivating against Beijing illustrate how from the 1970's to today, the US is still actively trying to contain China along precisely these fronts. 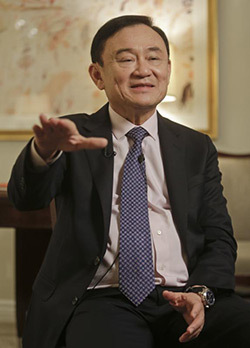 Thaksin Shinawatra before taking office as Thailand's prime minister in 2001, was a US-educated Carlyle Group adviser and considered a close personal friend of the Bush family. Upon taking office, he lent Thai troops to the illegal invasion and occupation of Iraq, gave US intelligence agencies access to Thai territory to conduct their abhorrent "rendition" program, and in 2004 attempted to ramrod through a US-Thai free trade agreement without parliamentary approval. Besides pandering to foreign special interests, Shinawatra is guilty of a vast array of human rights violations. In 2003, he would have nearly 3,000 innocent people gunned down randomly in the streets as part of a poorly conceived, politically motivated "war on drugs." In 2004 he would brutally put down a protest in which 85 were killed in a single day. According to Amnesty International, during his first term in office, 18 human rights defenders were either assassinated or disappeared. Shinawatra's consolidation and abuse of power was alarming. In 2006, Shinawatra was finally ousted from power. Despite fleeing the country to avoid a 2 year jail sentence, because of his wealth and foreign sponsors he was still able to wield considerable influence within Thailand. He would place into power his own brother-in-law, Somchai Wongsawat, and his sister, Yingluck Shinawatra in a demonstration of almost unimaginable third-world nepotism. 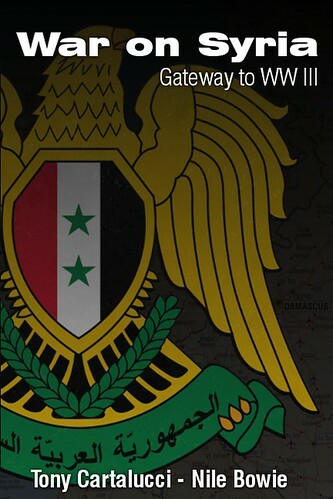 Each in turn was likewise ousted from power by court decision and military coup respectively. Since being ousted from power in 2006, Shinawatra has staged violence across the country, murdered well over 100 people through bombings, riots, mass arson, assassinations, and targeted killings. Perhaps because of his seemingly limitless utility to Western special interests, to this day he and his political front have received full-spectrum support in the Western media, from various Western governments, and from an army of Washington and London lobbyists. 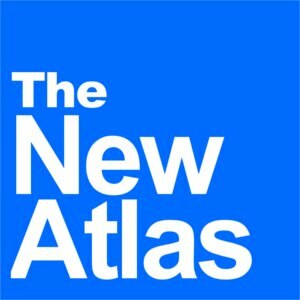 In Thailand, under the guise of defending "human rights," US and European-funded NGOs and media platforms continuously attempt to target and undermine Thai institutions including the military and the monarchy - both of which have served as a defense against encroaching foreign interests seeking to divide and destroy the nation. With this backdrop, in March 2016, Shinawatra would find himself in New York City at the center of a media event sponsored by the World Policy Institute - a policy think tank backed by the US State government and the Fortune 500. Among its sponsors includes the Heinrich Böll Foundation which also funds a myriad of fronts in Thailand propping up the remnants of Shinawatra's political influence. It also includes New America - a policy think tank funded over a million dollars a year by the US State Department alone, as well as by big-finance, and big-defense. Other sponsors include the European Commission, Facebook, JP Morgan, Northrup Grumman, Raytheon, and Citi Bank. 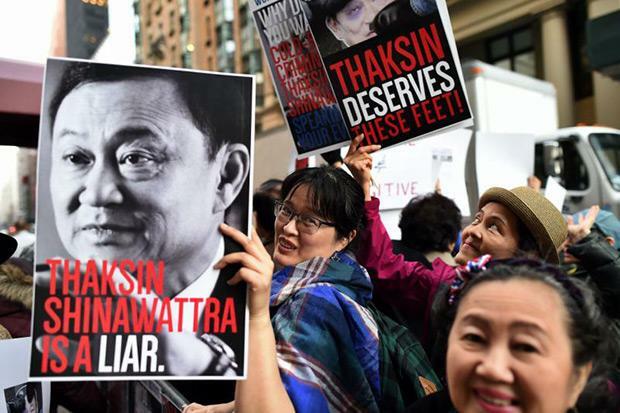 Image: While special interests in the US warmly welcomed ex-dictator, mass murderer, fugitive, and convicted criminal Thaksin Shinawatra, Thais residing in the US came out to protest the media event organized on his behalf. During this media event, Shinawatra would take the opportunity to attack the Thai government - in fact - the media event was organized solely for this purpose. In other words, the US State Department and Wall Street hosted a mass murderer in an attempt to boost his legitimacy while giving him a platform to attack and diminish the legitimacy of the Thai government which ousted what is clearly a rampant, abusive, dangerous criminal from power. Such events also remind the world of the nonexistent commitment the US has to impartially advocating human rights and holding accountable those who violate them. Here, the US is clearly, selectively choosing to excuse Shinawatra's human rights track record and the methods he still employs to this day, in exchange for the utility he serves in regards to Western interests. The US hopes to pressure Thailand into organizing early elections to once again put Shinawatra's family back into power either directly or by proxy, thus tipping off another round of violence, instability, and perhaps another opportunity to finally undermine and overthrow Thailand's indigenous institutions that have - thus far - obstructed the West's designs to co-opt and control the nation. With Myanmar in the hands of Suu Kyi's US-British backed political front and Thailand run by the Shinawatra family, Washington and Wall Street would have control over two large, geostrategically important nations upon which to build a larger united front against Beijing as well as a front to wield against other Southeast Asian states holding out against Western meddling. Amid the West's growing impotence in Asia Pacific versus Beijing, its game is becoming increasingly transparent and desperate. For the rest of Asia, the US hosting a convicted criminal, fugitive, and mass murderer in New York City, granting him a highly visible platform to attack and undermine the stability of a fellow Asian state, is impetus to work more closely together to diminish and excise Western influence from the region, and the toxic division and destruction it openly seeks to sow.